An important optimizing goal of the vehicle development process is minimizing the noise emission during pass-by of the vehicle. Already at an early stage of development the overall noise level is predicted, in the simplest approach as the energy sum of several noise sources like muzzle noise, drive train noise and tire-road-noise. 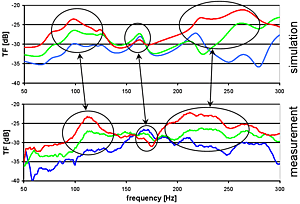 To obtain a more accurate prediction, the contributions of coherently interfering noise sources like intake muzzle noise and muffler muzzle noise are superimposed. For this purpose, in addition to the measurement of the required noise source information, transfer functions (TFs) between noise sources and microphones of the pass-by test are determined via a transfer path analysis. Instead of expensive measurements, the TFs can be simulated using the boundary element analysis (BEA) method. For this, the outer surface of the vehicle is meshed with shell elements adapted to the acoustic wave length (top figure). Because only frequencies up to 300 [Hz] were of interest, a rather coarse surface mesh was adequate. Monopole sources are positioned at the relevant noise sources. 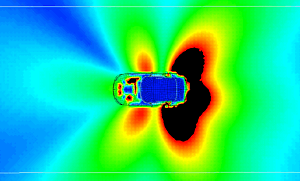 The result of the BEA simulation is the sound field distribution on the vehicle surface and in the exterior space (middle figure). The frequency dependent sound pressure at the positions of the microphones results in the desired TFs. The bottom figure shows the comparison between simulated and measured TFs from the intake muzzle to some of the microphones of the pass-by test. The functions from simulation and measurement show very similar characteristics. The observed slight frequency shifts of the maxima and minima are insignificant for the assessment of third octave levels and of the total level. 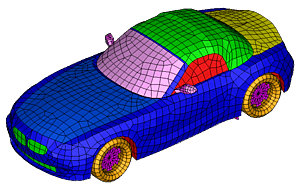 In combination with the time dependent vehicle position and the motor speed dependent noise source data, the simulated TFs are used to predict the noise levels during the pass-by of the vehicle.